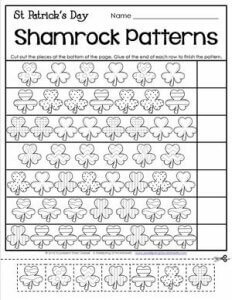 Now here’s a St Patrick’s Day worksheet that focuses solely on the emblem that represent’s the holiday – the shamrock. First, have kids cut out the shamrocks at the bottom of the page. Then have them look carefully at each row and determine which shamrock comes next. Lastly, they glue the shamrock in place and repeat this until all seven shamrocks are glued.